The drawing on the far left was done by Bitter Lilly for Valentine’s Day. (I’m sorry it took me so long to put it up!) I don’t know the image that inspired her that she refers to on her original post, but I love how soft and ethereal it looks, especially the turtleneck — you can almost feel it, and if I had a turtleneck like that I would always keep petting my own arms and people would look at me strangely. 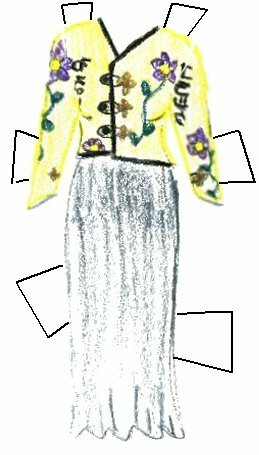 These days I don’t get too many fan submissions of outfits that fit my dolls; I suspect a lot of that energy has gone into people creating their own paper doll blogs, as a glance over my blogroll can attest. (Have I mentioned lately how much I love my little subculture? I have high hopes of us landing on the xkcd Map of Online Communities someday, on a little island right near “Diary Blogs” and “Writing/Poetry”.) But back when I did the Boutique, I did have some people send in some great outfits. The blue gown and the yellow jacket with a white skirt are actually by my cousin Becky; if you’ve been paying attention you may remember her from this purple gown and this fairy dress. 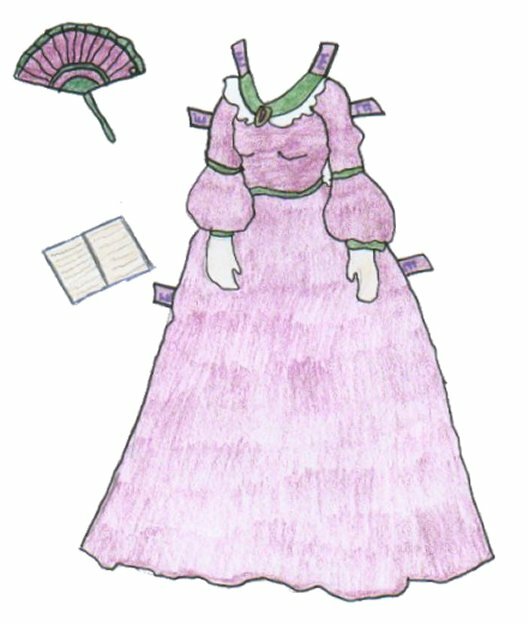 The pink and green hoopskirt was by someone who wanted to be called “Anonymous” and of course, I’ve lost the original e-mail so I can’t credit her properly ten years later. 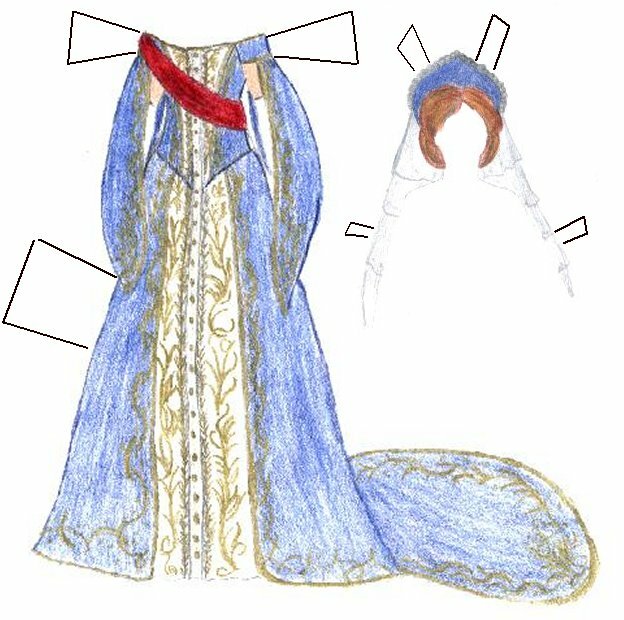 I had to go back through my files to place a name on most of these, but the geometric blue evening dress is evidently by Emily. Jedi Guinastasia did quite a few for me, particularly a number of dresses from Titanic; the layered dress from Titanic and the blue gown are by her. Now, how is that for a really lazy post? I didn’t draw a single part of it! Well, I will be back from my trip soon, so look for a new dress in a couple of days! Wow, first to comment. This is a really neat dress, Bitter Lilly! Honestly, I’m surprised that that someone with a name like that could create such a soft-looking, beautiful outfit. Congrats! Also, Liana, I might make my short-story blog (Blue Jasmine Blog) into a paper-doll blog. I take art lessons and sketch for hours at a time, but I might have a little trouble drawing the dolls. Wondering if you have any pointers?? Thanks! Me too! I love drawing dresses and outfits, but my dolls look really bad. I’ve ended up using some old ’50s paper dolls and designing dresses for them. I love the Titanic dress – super cute! The carousel outfit’s really cute, and I like everything else too. I do hope we end up on that map. I was expecting a list when I looked at it, and was pleasantly surprised when I saw a literal map. It would be nice to be over there..